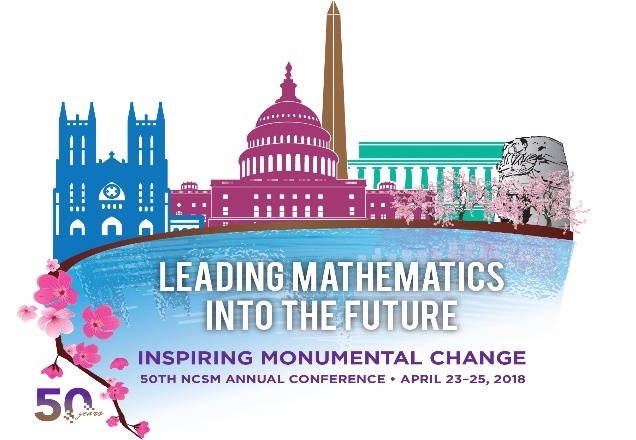 What's New at NCSM: Call for Nominations Ends Today! Nominations for 2018 NSCM available positions will close later today, May 15, 2018. The positions available for nominations can be found HERE and more information about the nomination process can be found HERE. Join us for the Collective Call to Action's next book discussion and webinar (May - June) which will be facilitated by TODOS: Mathematics for ALL. The focused article is in TEEM 7 - Teaching Excellence and Equity in Mathematics, Special Issue: Mathematics Education Through the Lens of Social Justice: Chao & Jones (2016). That's not fair and why: Developing social justice activists in PreK, pp. 15-21. Available online HERE. The TODOS: Mathematics for ALL, 2018 conference is June 21 - 23, 2018 in Scottsdale, AZ. The theme is It's ALL about ALL Students Learning Quality Mathematics: Advocating for Equity and Social Justice. Keynote speaker is Dr. Maria del Rosario Zavala. Registration information can be found HERE. The Meeting Within a Meeting (MWM) Statistics Workshop for Middle and High School Mathematics and Science Teachers/Supervisors will take place at JSM on July 31–August 1, 2018. The workshop is offered by the American Statistical Association (ASA)/National Council of Teachers of Mathematics (NCTM) Joint Committee on Curriculum in Statistics and Probability in conjunction with the Joint Statistical Meetings (JSM) 2018 in Vancouver, BC, Canada, though registration for JSM is not required. MWM will strengthen understanding of statistics and provide hands-on classroom activities aligned with NCTM standards, Western and Northern Canadian Protocol (WNCP) Curriculum, Common Core State Standards, and Next Generation Science Standards. Optional graduate credit is available.The MWM program is posted online. Registration is just $50, and the ASA will refund $25 to the first 30 teachers/supervisors who register and attend. Teacher educators and pre-service teachers are also welcome. Registration will be open until July 16 or until the course fills, but a limited number of scholarships and reimbursements are available, so act quickly and register soon! Attend a free webinar to learn about the results of Education Development Center's (EDC) national survey of over 860 public schools about their approaches to providing mathematics intervention in grades 6-8. Learn about schools’ varied approaches to staffing, scheduling, structures, and content for mathematics intervention classes. Delve into common challenges, learn about recommendations from the field, and consider implications for your role, school and district. Thank you to everyone who contributed NCSM’s 50th Annual Meeting. Our celebration of over 2100 attendees was outstanding. What fun we had! If you were unable to join us this year, search on twitter with the hashtag #NCSM18 to find out what was being said about the conference. There are videos from this year’s conference on NCSM's YouTube website for you to view and soon others will be available on our website as well. Also, look for notice soon on our NCSM website on how to purchase the 50th Anniversay Monograph. I would encourage to you to start making plans to be a part of the 51st Annual meeting next year in San Diego where we will be Making Waves with Effective Mathematics Education Leadership. What will help you in your work? Is there a position paper that can support what you do? What about themes and/or content for leadership events? Is there a speaker you would like to hear next year in San Diego? Or, is there some other idea you have for our organization? You can let us know your thoughts by posting on this new padlet. 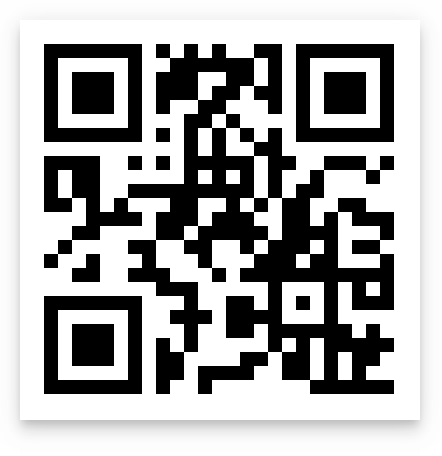 Access the padlet HERE. Thank you in advance for your suggestions. We are looking forward to our next 50 years! Thank you for attending the 50th NCSM Annual Conference in Washington, DC. We rely on your feedback about the conference to help in planning for future conferences. Please take a few moments to complete the conference survey at HERE. This will help us plan for the 2019 San Diego conference as well as for future events. It's Time! NCSM is accepting proposal for the 51st Annual Conference in San Diego, California from April 1-3, 2019. 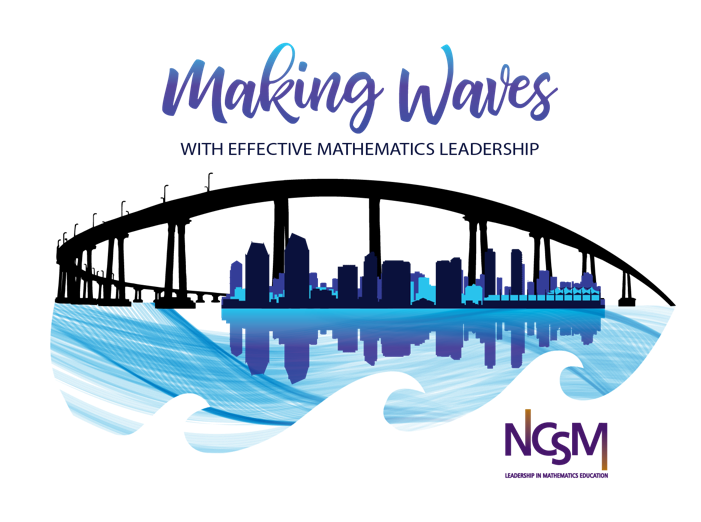 The conference theme is Making Waves with Effective Mathematics Leadership. Please consider submitting a proposal to speak AND reaching out to those that look to you for leadership to encourage them to do so as well. Many of us needed the support and guidance to take that big step to speak on a national stage. Be that inspiration for someone that you lead! 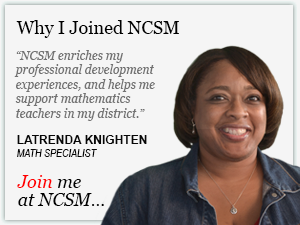 NCSM Affiliate Groups are Growing! We welcome these new affiliates to the NCSM family. If you are part of a mathematics leadership group and are interested in finding out more about becoming an affiliate, please contact Nanci Smith, Affiliate Groups Chair. And a friendly reminder that many affiliates were due to renew their status as of March 30th … Have you renewed? Time to Register for the NCSM Summer Leadership Academy, "Building Mathematics Leadership: Coaching"
Are you ready to make a real difference in the teaching and learning of mathematics? Do you realize that coaching is recognized as one of the most powerful ways to impact teacher growth and student learning?